For now, Saturdays are Squash-only endeavors. With races coming up, he and I need some practice alone, and since Maisy is not always so nice to other dogs I don’t like to take her out on the weekends anyway since we are more likely to run into more dogs getting walked on the trails we use. So out Squash and I went this morning, in about 4″ of freshly-fallen snow. However, I had failed to realize how difficult it is to skate ski in 4″ of ungroomed, freshly-fallen snow or how while it is possible to classically ski with skate skis, they are subpar for the job. So this run became more about stamina and physical resilience and MY lessons learned than about training my dog or having transcendent experiences. (Although it was kind of cool that after a certain distance we were the first ones on the trail, trailblazing along.) It was a slog, but live and learn… next time I’ll know that the touring skis would be a much better choice and I’ll better know what to expect. And this… this just squeezes my heart. This was very near the end, you can see our tracks from the trip out. He was so tired but still trying to work so hard, and I guess he needed a little pep talk. This is such a “Squash” moment and he’s so sweet, and I’m so glad we have this relationship. We were on the trail where the swans hang out on open water. I used them as an excuse to take a nice long swan-watching break. I think it is too small to see, but there was a single… confused? rebellious?… pelican among the swans. I shot some video but you’re probably going to have to turn your sound all the way up to hear them. I’ve seen swans before, but I’ve never heard so many making so much noise and it’s a really cool sound, I think. I’m not going to post any more video. There’s a lot of video of us sort of trudging through the snow, me periodically exclaiming how ridiculously hard the skiing was. But the stuff above, I think, really encapsulates the important stuff… It was hard work, and he really hung in there, and I’m so proud of him. And at the end of the day, I’m just out there playing with my sweet silly dog, having fun. And I hope you are all out there doing the same, whatever your game happens to be. 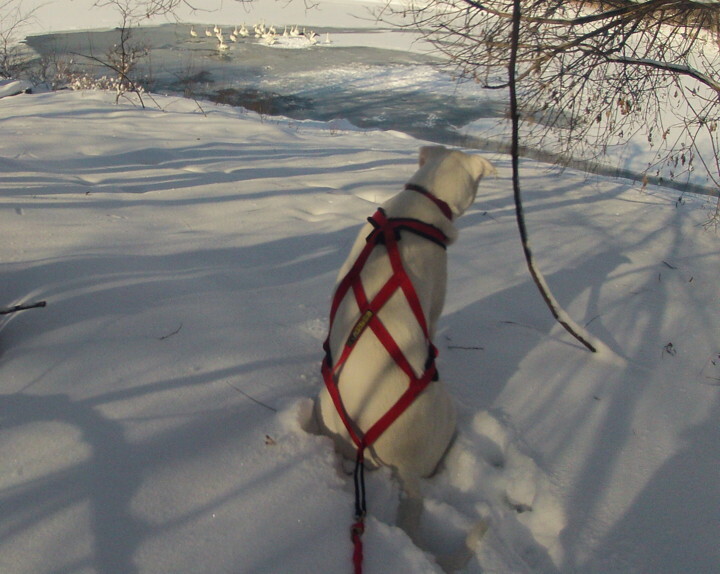 This entry was posted in Gush Puppies, Skijoring, Squash. Bookmark the permalink.